Currently a student at Kansas State University, I am studying Sociology, which means I study people. People fascinate me. I have the attention span of a hamster. Oh look, glitter! It looks like little old me is tying the knot at the age of 22. Before you ask who the lucky guy is, save your breath. There is no guy. I'm getting married to MYSELF! 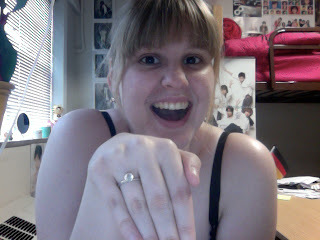 I decided since, you know, I'm going to be with myself for the rest of my life anyway, we might as well make it official! To marry oneself may seem a tad narcissistic. But really, in my own situation, Its a way of celebrating that I have managed to find the love for myself that I deserve. After all, you can't love someone else until you love yourself. And besides, this is a chance to have a wedding as silly and crazy as I truly am! I've decided to have a Kanjani8 themed wedding, something that probably wouldn't be so appropriate for a wedding involving someone else. This is all my own, this represents me and my love for me and no one can tell me its wrong, no one can tell me its stupid, and no one can make it about anyone but me! I think everyone should get married to themselves first! You are the only one who is always going to be on your team, no matter what happens, so put yourself first! Commit to you before you commit to anyone else! Check out my Japones episode, all about how to plan a Kanjani8 themed wedding! I explained in a previous blog entry about my new-found addiction to kawaii. Well, I'm showing off my very small collection, little by little. This post is all about the mini memos. ...and this is the other half. What I have learned from my first few purchases of mini memo sheets? Well, I like the sweets ones and the San-x ones the best. In the future when I start buying whole memo pads, I'll know to buy mostly sweets and san-x. 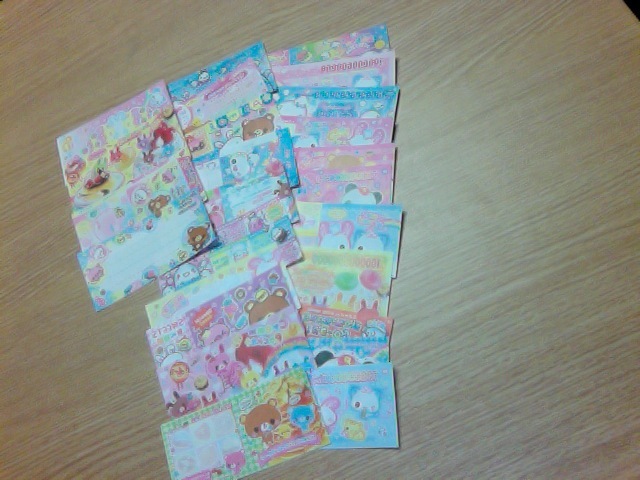 And these little sheets are just adorable. Some of them look like coupons and money while others can be cut into tiny note cards! 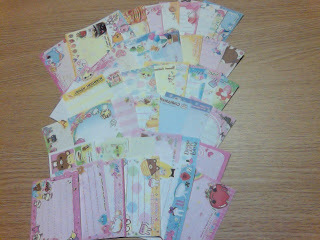 In conclusion, mini memo sheets are fun to collect and stare at. While I'm still pondering that scrapbook project that's moving much closer to the front of my mind these days, I'm thinking these will come in handy for that. motivation, inspiration, and just plain pure love. Its been almost two years since I fell head over heels for a seven man Japanese idol group by the name of Kanjani8. These crazy Kansaijin have Obachan Rocked their way into my heart and they aren't going anywhere for a long time. Kanjani8 has become a huge part of my life in these past two years. What can I say? Once you get into an idol group its like accepting a whole new culture into your life, and really seeing as this group is Japanese its like accepting TWO different cultures. Following this group has become somewhat of a lifestyle, and through this lifestyle and I have been able to meet and interact with some really awesome people, I've picked up more Japanese than I could have in the classroom alone, and I've learned a lot about Japanese culture and their social interactions. You could say that by digging myself so deep into this fandom, I've created for myself a little Japan within Kansas. You haven't seen a Kanjani8 paradise until you've seen my room. For those of you who are not familiar with Kanjani8, look them up on Wikipedia for starters. Kanjani8 as well as those of us who are fans of Kanjani8 are all called Eighters, and we carry our title proudly. We don the colors of our favorite member(s), energetically sing and dance to Zukkoke Otokomichi, and laugh ourselves silly at every funny thing they come up with. What's great about Kanjani8, though, is that not only can they be funny, crazy, and light-hearted. They also come with a sentimental, inspirational, and motivational super package that keeps a nice balance between bright and happy and deep and emotional. Themes that are common in Kanjani8 music are friendship, positive thinking, and just plain getting through life. I think if it weren't for Kanjani8, I would have quit learning Japanese two years ago. I wouldn't have experienced some of the things that I did while I was in Japan. I wouldn't have had the courage to go off to a strange country by myself and be truly independent for the first time in my life. I wouldn't have ventured out alone, I wouldn't have met the awesome people that I've met, and I wouldn't be this person I am now. Its truly amazing to think how a manufactured group of idols could somehow change the way you are, the way you see your world, and even the languages you speak. I've been going through a rough semester, most of my issues stemming from the Japanese class that I am taking this semester. At this point I am only taking to course so that I can pass it and be done with my language requirement and graduate from college on time. My Japanese teacher is harsh, to put it lightly, and brought me to the point where I have started to HATE learning Japanese. But as I'm talking with Japanese Kanjani8 fans and listening to Kanjani8 music and watching TV programs with Kanjani8, I realize that I can't give up on this language. I just can't. I have to keep trying, I have to keep learning. I have to keep going. Kanjani8 truly is my motivation, my inspiration, and just plain pure love. Recently, I have a new addiction. It isn't drugs. It isn't alcohol. It isn't bad reality television. What is kawaii? Well, technically its a word in Japanese that loosely means 'cute', though the true meaning goes beyond just 'cute'. For the purpose of this post, kawaii means cute. Specifically, there are various companies in Japan that create these kawaii characters and slap them on just about everything, mass produce the products, and sell them pretty much everywhere in Japan. There are specialty stores even, such as the Rilakkuma store, that sell only products with the Rilakkuma character. 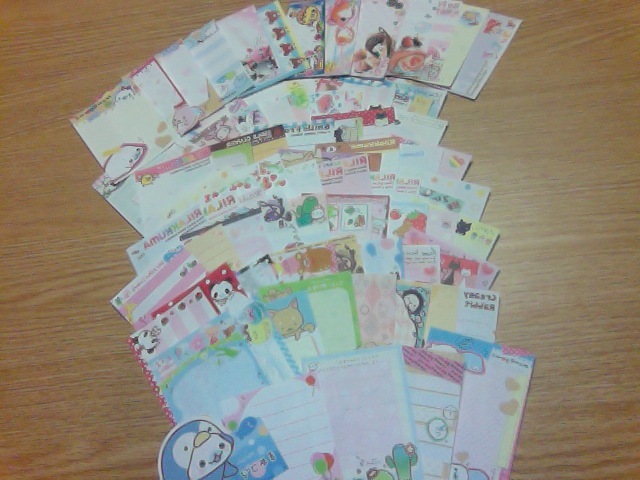 Beyond that, my addiction is mainly focused on stationary. On Etsy, there are various shops where you can buy loose memo page grab bags, sticker flake sacks, deco tape, and the list goes on. So far, I have indulged myself in memos, lettersets, stickers, and accidentally some deco tape. At the moment, I have no idea what to do with my collection other than sit down every once in awhile and stare at the utter cuteness. Maybe one day I'll actually get to that scrapbook I've been wanting to make and use some of my kawaii collection to dress it up in. For now, I will continue to collect and become another victim of the kawaii craze. This past weekend, I attended an event that would make some green with envy, and others green with nauseousness. That's right, I attended my third Johnny's concert: 横山裕がやっちゃいますIII (Yokoyama You ga Yacchaimasu III). Of course it was a blast. After all, Yokoyama You is the reason for my major obsession with Kanjani8. In fact, when I first started listening to Kanjani8 and watching their TV shows, I swore up and down that I would only focus my attention on Yokoyama. Look how great that turned out. Back to the task on hand, attending one of these concerts is a really interesting Japanese culture experience. The way Japanese girls celebrate their idols is fascinating from a sociological perspective and if being there scares you at first, you should stick it out and simply observe. Many fans dress to get the attention of their idols on stage, whether they be in homemade costumes worn by the idols during previous performances or the infamous Eito Ranger costume. In fact, creativity and craftiness is a huge part of attending a Johnny's concert. Its not only the clothing fans wear to attend, but the accessories they don as well. Giant head bows are a good place to start, but teddy bears dressed in handmade Eito Ranger suits are also an attention grabbing craft. No joke. This girl had her bears dressed as Red Rangers, one was a boy with pants and the other a girl with a skirt. Scary? Yes. Adorable? UM YEAH. Venues have poster size restrictions which prohibits anything bigger than a jumbo uchiwa from being displayed. Of course, with these limitations, fans find ways to make their uchiwas stand out. You can buy uchiwa supplies at craft stores in Japan, such as Loft and Tokyu Hands, all in their glittering neon-colored glory. With these cultural facts in mind, I ventured out to the concert, held in Nagoya on this particular weekend, dressed to grab attention with my neon uchiwa and eito penlight in hand. Needless to say, I fit right in...aside from the whole ~180cm tall, blonde haired, foreigner thing. I've been in Japan since September 2009, and since I've been here I've had the opportunity to attend not only Yokoyama's concert in Nagoya, but his concert in Osaka, as well as Kanjani8's countdown at Kyocera Dome. The fans, to me, were just as entertaining as the concert. With the efforts Japanese fans put into their crafts, I'm sure showing them off at the concert must make the experience more memorable.